The total budget I had left over for April and May increased to $146 from $71 because I ended up returning the Anthropologie dress I noted in my March budget post. I hadn't even worn it and I found snags on it. Easily snagged fabric + cats with claws = bad news. (It was hanging in my closet, FYI--no cats got to it!) I still went a little bit over budget this month regardless of the increase. I'll likely make some returns in May to get back in the positive. I made a huge purchase at J.Crew Factory this month. Everything was 40-50% off (I think) plus an additional 20% off if you spent over $125. I'm still on the fence on the tops I got. I was most excited for the collared eyelet top, but it's completely see-through and I did not expect that at all. I'm not sure if I want to wear a camisole with it all of the time. I won't be keeping both of the other eyelet tops, but I haven't made it to the store yet for returns. I can't decide which color I like more! Ah! The bikini top I got was more than the bottoms because I had to do an exchange and the return fee tacked an extra $5 to its cost. I can't wait to wear it this summer! I'm also on the fence about the AEO sandals. They're not very comfortable, but I'm having a heck of a time finding black sandals I like the look of. It's probably not worth it to keep these. All of my Madewell purchases were winners. 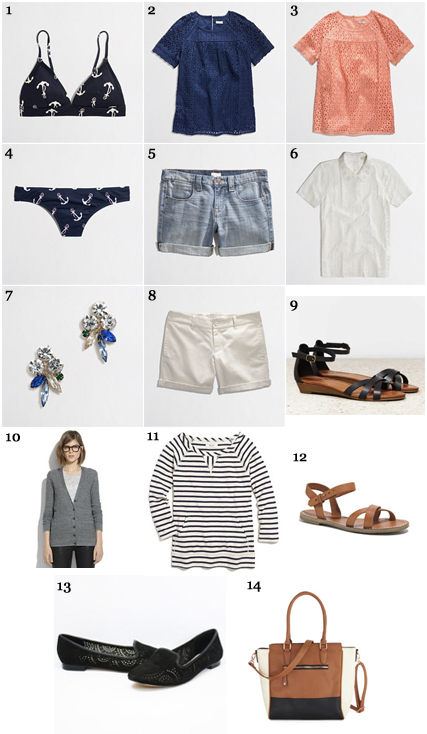 I cannot wait to wear the striped tee, and the sandals are exactly what I was searching for! It feels good to be crossing things off of my spring/summer list that I've been wanting for weeks. The Vince Camuto loafers were basically love at first sight. It's too bad they're not available at the regular Nordstrom in my size because they are less expensive there! I'm surprised I like them so much because the cutouts are pretty trendy. I've had black flats on my list for a while though with no luck finding any, so these are perfect to fill that hole. The reviews are a little bit iffy so I've been wearing them around the house to see if anything bad happens to them (such as stretching too much). Lastly, I grabbed the ModCloth tote since I've had it on my list since January and I finally got a coupon code. I'm so weird about bags. I don't fawn over them, but at the same time, I'm completely indecisive about them. I think I'm mostly concerned about the quality of this bag. I can't tell how long it will last before looking beat up, and it hasn't be around long enough for any reviews about the longevity of it.